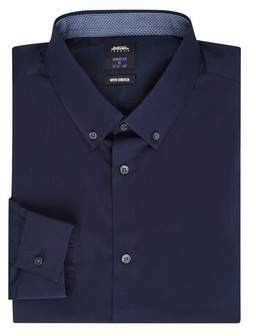 In Navy, This Big & Tall Skinny Fit Shirt Is Perfect For Everyday Wear. Its Stretch Fabric Will Keep You Feeling Comfortable All Day Long While Also Providing You With The Perfect Fit. Pair This Shirt With Our Wide Range Of Formal Trousers.Size & Fit: Model'S Height: 6 Foot 1Model Is Wearing Size: Xlfabric & Care:62% Cotton, 33% Polyester, 5% Elastane.Machine Washable.